Does your home have new or original wood windows? Whether new or old both need maintenance to keep them in good condition. Here are 5 steps for keeping your wood windows looking their best! Over time windows can have a lot of built-up dirt and grime. First dust off windows with a dry rag. Repeat this process until there is no dust left on the window. When this step is finished, a vacuum or broom might be needed to collect any dust or dirt that is below the window. You’ll need a clean cloth, get the cloth damp by soaking it in water and then ringing it out. A wood cleaner is preferred for the best results, but if that isn’t available dish soap is also an okay substitute. Place a towel or tarp below the window that is being cleaned to avoid cleaning up an extra mess. Have one clean dry cloth handy in case of any dripping water from the damp rag. Scrub the window frame with your damp cloth. This process should be repeated until satisfied with the results. If the process is repeated, clean the cloth previously used or scrub with a new clean cloth. 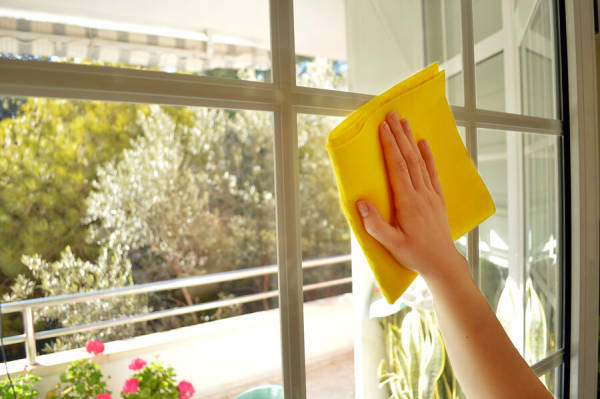 It is recommended to wash the window and surrounding areas after washing the frame. This process is only necessary if you feel more clean up needs to be done. When cleaning window frames, this is a great time to check the condition of the window. Don’t know what to check for? At EHI, we suggest to examine the weather stripping and seal; they should be in place correctly with no damage. No moisture should be between the window panes. If any of the problems listed previously are detected your window might be in need of a repair.